One of my earliest blogging 'successes' was a blog post titled Eleven reasons why I won't return to your blog. It had a list of reasons why visitors may be put off by a blog, and possibly not return to them. I've been meaning to do a follow-up, and things have changed even in the span of a year. This time, apart from my tips, I'm including those of the people who responded to my question about their blogging peeves on Google Plus, Facebook and Twitter. 1. Pop-ups - What is this, the 90s? Pop ups aren't dead, but they have to be used very wisely. Anything that obscures your page before the visitor has a chance to see your content is a dead end to them. 2. Mobile un-friendly - Responsive themes (which recognise and display according to screen size) are not hard to find, and at the very least you can enable a mobile version of your blog. Most of my reading is done on my handheld, so I really can't read blogs that aren't suited to it. 3. Unclear font - Small fonts seem to be a relic of the newspaper era. If you want your writing to actually be read, choose a font that's web-friendly as well as clear. Don't get too fancy with the body text, and choose a size above 12 points. Refer to this list of web-safe fonts. 4. Too small pictures - If you are using good pictures, please don't make me squint to admire them! Don't be stingy with the picture size, but make sure they are lightweight too. 14. And this can't be reiterated often enough - check your posts for spelling and grammar! And for the love of God, turn off CAPTCHA - it is universally hated. What are your blogging peeves? Comment below or let me know via the #bloggingpeeves hastag! Yes, yes and yes! I love your points and I like all the input from other bloggers. Thanks Mandy, for your contribution too! This is really well done, and I loved being part of how it was put together and to see how the crowdsourcing worked. You did well, and yes - a very comprehensive list of peeves. My pet peeve as a blogger is receiving nonstop comments from people who say, "Is it just me or are the people who commented on this post total idiots," then they follow it up with a comment lecturing me about sharing links on social media. Why would I share comments that insult my readers; that were clearly made by someone who did not take the time to read the blog ("I agree with your argument" is one often sent to my history blog, and I do not argue on my history blog); and who is clearly leaving a comment only to snag a share. I LOVE comments from other bloggers, but only if they've actually read the post and I think link sharing for the sake of sharing a link is the same as spamming. When another blogger comments directly on the post, or is even close to the mark on the topic of the blog, I will post the comment. Nice tips and very useful since they come from bloggers themselves!! Oh yes... all of the above and I will never go back if there is 'captcha'. Never. Thank you, I was afraid I wouldn't get enough replies...phew! I agree, that is spamming, and in fact, trolling. It's best to keep them off the site, else everyone else is just going to leave. Thanks for sharing your insights! Yes, yes, yes, to everything especially #10! I get really annoyed when some blogs make it so difficult to comment, so many numbers you have to type in (some of them aren't even clear). And you have to do this not once, but twice! While I understand that they are trying to avoid spam, however, I think it's also driving readers mad and away from their blog! #PoCoLo. It's especially annoying when you will fill in Captcha and then the comment is moderated! I know people do it because they don't realise how much readers hate it, and that's why we need to spread the word. You can always check the box to notified of replies! Yes, Roshni, I'm glad I got good feedback! Glad you liked the tips, Chris! Tarana, I honestly think you write the best blogging tips that I have found in the blogosphere. I loved you post 'Eleven Reasons Why I Won't Return to Your Blog' and I love this one too. There's one blogger whose writing I really enjoy but the font on her blog is so difficult to read that it puts me off because I have to squint so hard to read it (and I don't even have any vision problems!). And OH how I hate CAPTCHA! Trolling--good point. I think it's a combination. They want to insult people who will then go to their page and give them more page views. Either way, it's not blogging. I was surprised by the person who responded to my comment deletion by trying to explain link sharing to me, especially since the link was to a sales page. 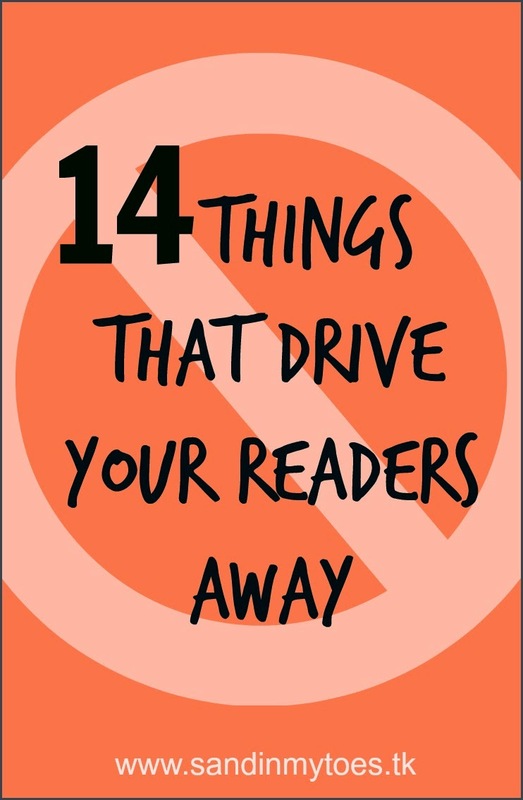 What I like most about this post is that it focuses on how to keep the reader happy and I think that's where many bloggers fail--they forget about the reader. Great tips. Captcha is very annoying, I often have to refresh it because I can't read the text and then when it does go through and your comment isn't published because it's then in moderation I get so frustrated! Thanks, Darla! I think we should have zero tolerance for such kind of people, whose only aim is to draw attention to themselves. I agree with every one! Especially CAPTCHA - hate it! Great list. I don't mind the small fonts so much as I just make the screen bigger. Captcha does make me groan. It's all numbers now. At least when they used words, there was a chance that something mildly amusing would come up. Going off to check that I'm living up to the other points. Meant to add that I give up on blogs that are forever promoting products. That is dull. Thank you for your kind words! Fonts are so important, and that's why simple is best. That's what any web designer will tell you. Yes, that is an important point to remember. Now, I have acquired the habit of opening all links in a new tab, just to be sure! Pretty fonts look great, but only when they don't hamper readability, such as in titles and headings. Thanks for stopping by! I never get it right the first time either! Good points, Cheryl! Too many promotions can end up making a blog virtually uninteresting. If I like the blog but there is a captcha I might comment once saying that the captcha is there and that it is very off putting - it's amazing how many people don't even realise it's switched on. If it stays though I tend to go. All very good points! For me the very final point is a regular turn off: if someone has clearly either not spell checked their blog or just can't spell/use vaguely correct grammar I just can't read it, however lovely the blogger is. Also, just bad writing. If someone writes rambly posts with no definite 'story' and no clear beginning or ending, then I'm not going to come back for more. And finally, if someone only seems to post reviews then I switch off pretty quickly. I read blogs to be entertained and edified, not for shopping tips. Basically, if the content is good and well-written I can forgive any aesthetic issues, but a blog can be as beautiful if you like, if I don't like the writing then I'm not going to read it again. Yes, little things like font and design do make a difference! You made me smile - especially number 14! I agree with each and every point. One more that I find very annoying and won't read past the first line is when the print is white on black background or vice versa. It has a glare, is difficult to read and not worth the headache. I also appreciated all the comments from other bloggers. I am not sure what you mean by "Approve" ?? Argh! So sorry, Carol! I'm new to Disqus, and your comment went into moderation because of the included link. I was trying to publish it but I obviously messed up. Great tips, I only found out that I could turn captcha off a few months into blogging - it makes it hard to comment when on my phone. Great post and I agree on all counts! Inaccessible fonts and page designs are the things that annoy me most. That and people failing to check their spelling and grammar. Grrrr! Please get in touch if you want me to explain any of these points in detail. I'll be happy to help! I know it comes on as default, which is why we all go through that learning curve! Great crowdsourced post, and you are really observant about the finer details of blog infrastructure. Thanks for sharing your points! Helpful to plug and play folk like me! Many many thanks for the advice! I am new to blogging and I worry my blog is a bit stuffy so people are afraid to comment, but I am quite eager to make friends and I comment on and tweet other people's blogs all the time! I will be following your blog now! One thing that is hard about blogging -- meeting people you wish you could really meet but alas, we all tend to live in other cities! Happy you liked the tips! Commenting on other blogs is a great way to make bloggy friends.